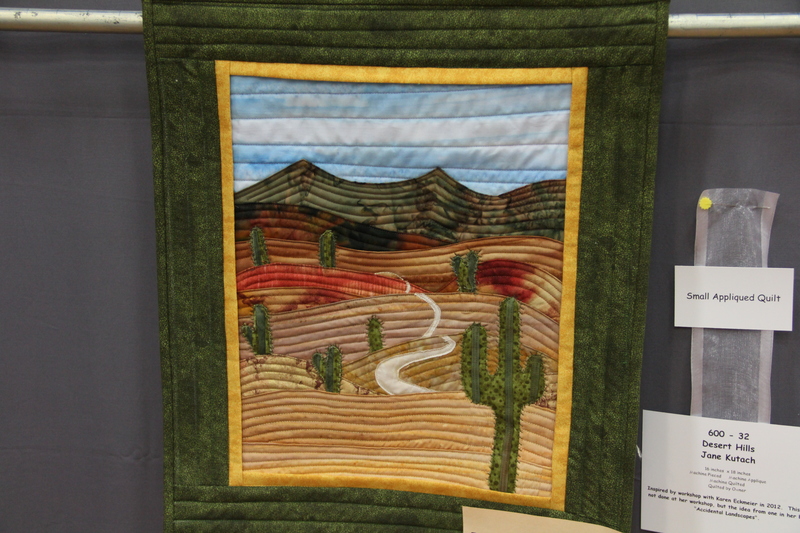 The “Hill Country Quilt Guild” held their bi-annual quilt show this past weekend. The hubby and I headed out very early Saturday morning (it is about a 6 hour drive). We stopped by our property in Luling and wandered through 4 houses that are currently being built in the “neighborhood”. We plan to break ground in 2014 – pretty exciting! 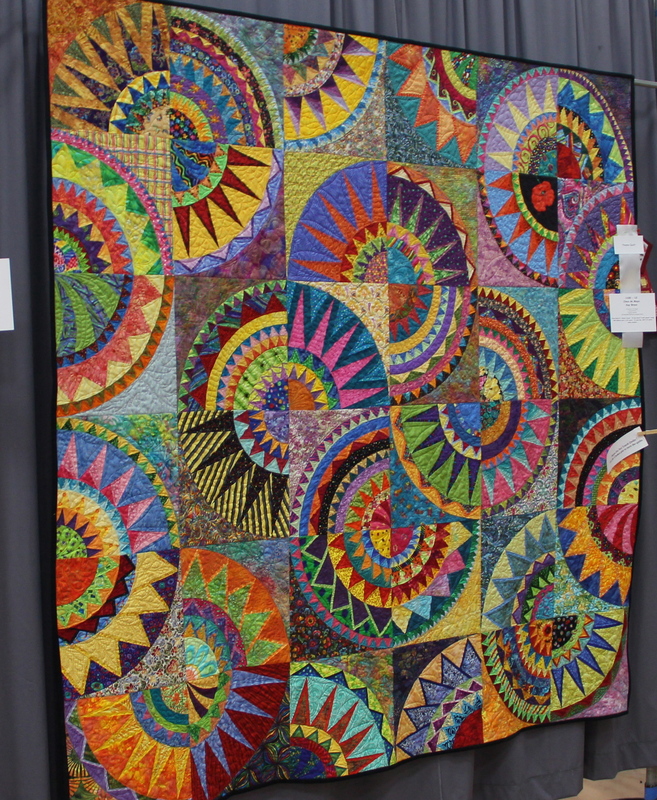 Back to the quilt show – after we left Luling we found ourselves driving in heavy downpours of rain, apparently San Antonio area received over 12″ of rain between Friday night and Saturday evening! WOW! After stopping for a quick lunch of empanadas and other delights at “Beto’s” in San Antonio (Find out more about this treasure at Diner’s Drive-ins and Dives), we were back on the road again. We arrived at the show and my friend, Susie, met us there. 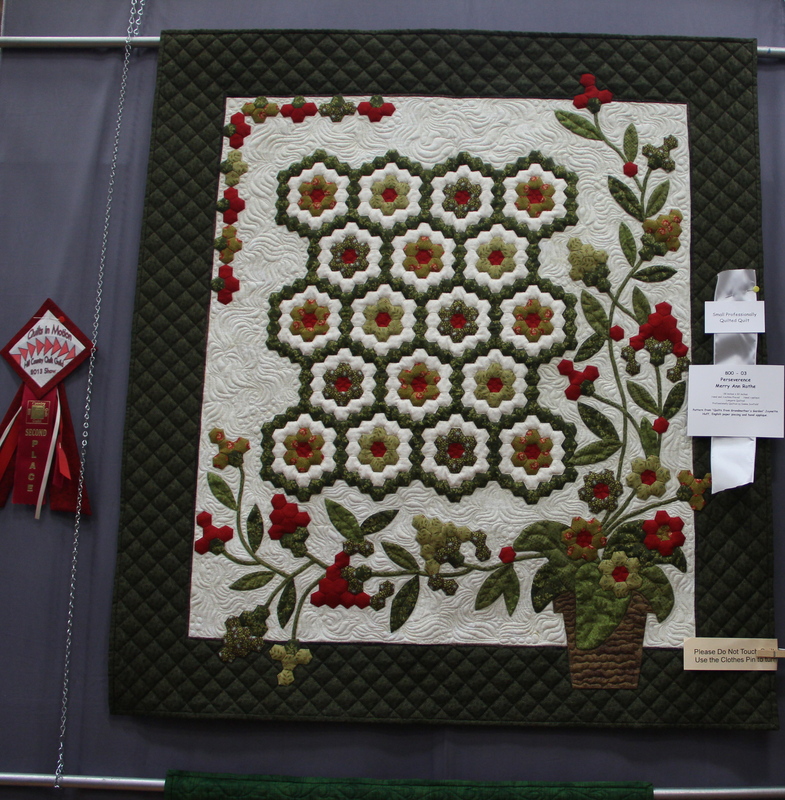 She is a member of the Hill Country Quilt Guild and had a few quilts in the show (with ribbons on them!). 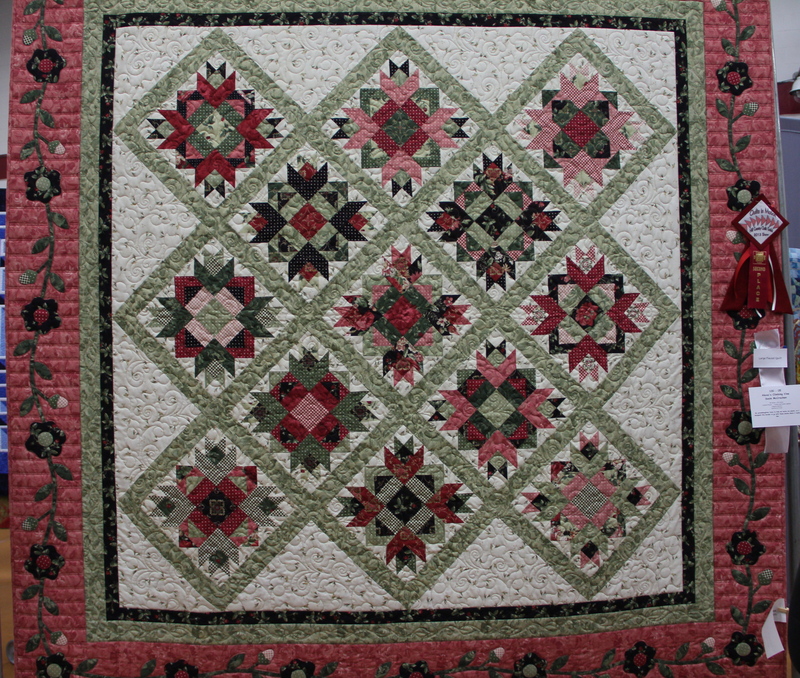 One of Susie’s quilts – I quilted this for her – her quilts are a delight to quilt – she is very good piecer and I love her colors and pattern choices! 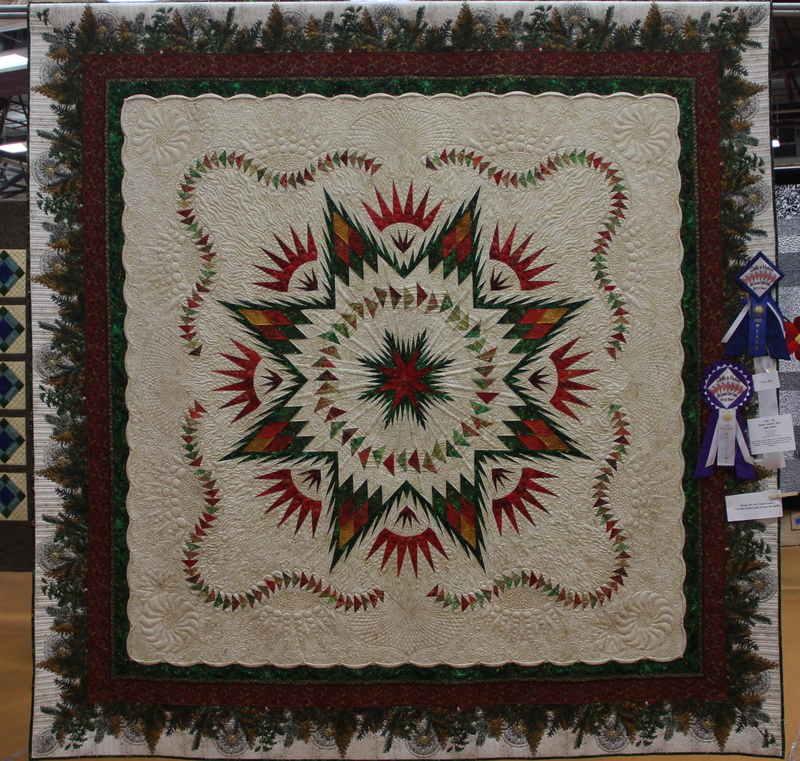 Susie’s Prairie Star (quiltworx.com pattern) – yes there is a ribbon on the right side! 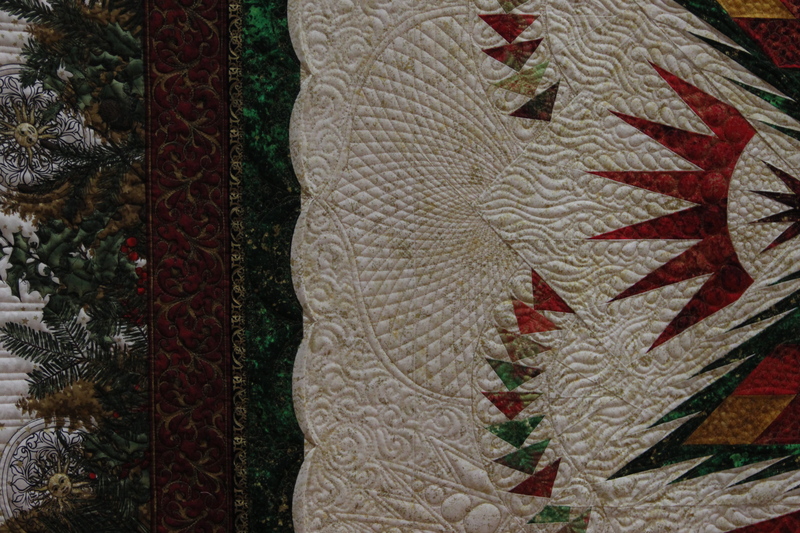 I quilted the quilt below for Susie earlier this year – I really enjoyed this one! What I enjoyed almost as much was I sent her my king-size triple 4-patch to quilt and I just got it back. That was a GREAT TRADE! 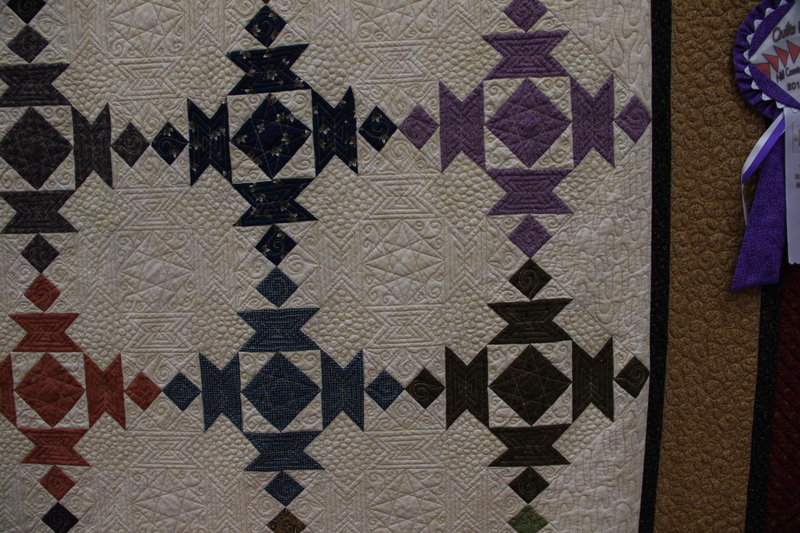 Susie’s Quilt – she added the pieced sashings as well as the applique border. The pattern had plain sashing and border. 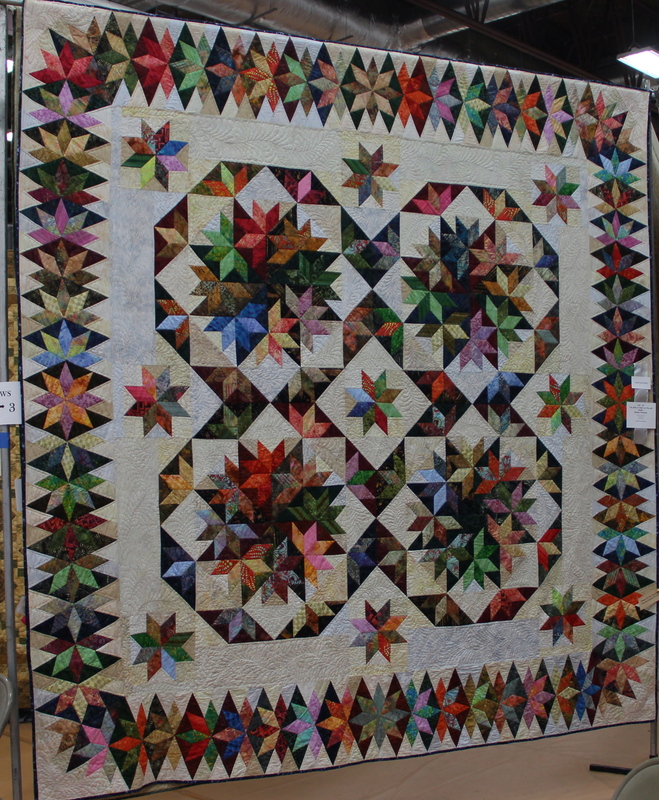 This quilt of Susie’s was made as a block of the month from Pinwheels and Posies. 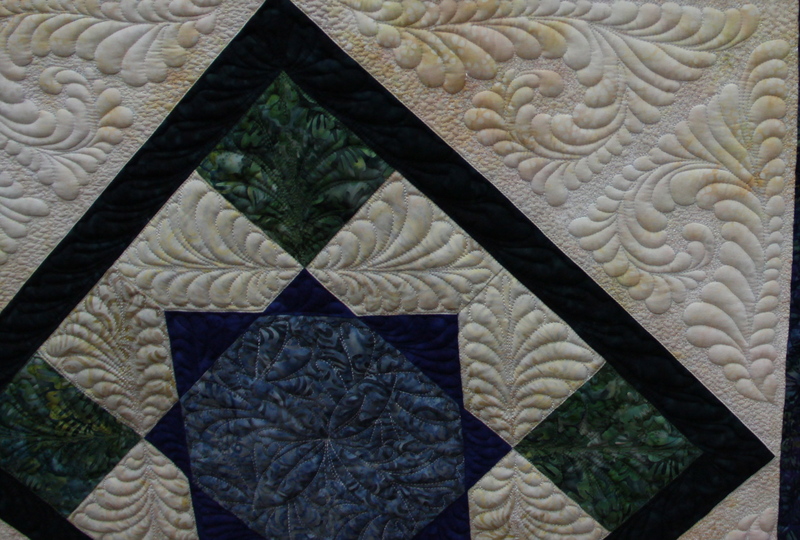 Each block is the same (except for fabric placement), Susie quilted this one! 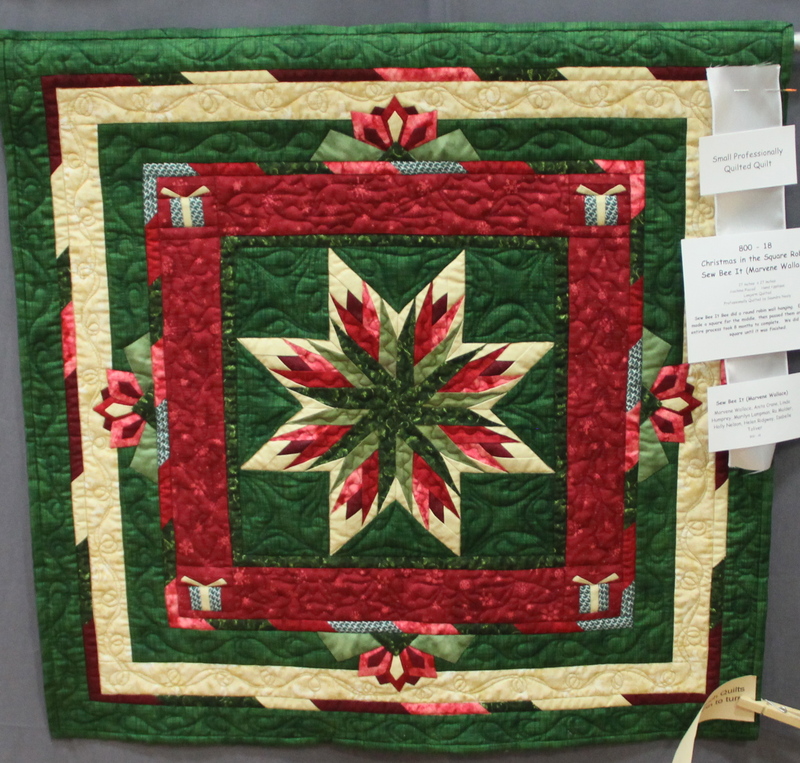 Another student, Linda, was also working at the show and had a ribbon (or 2) on her Glacier Star Quilt that was started in a class I taught at Pinwheels and Posies. 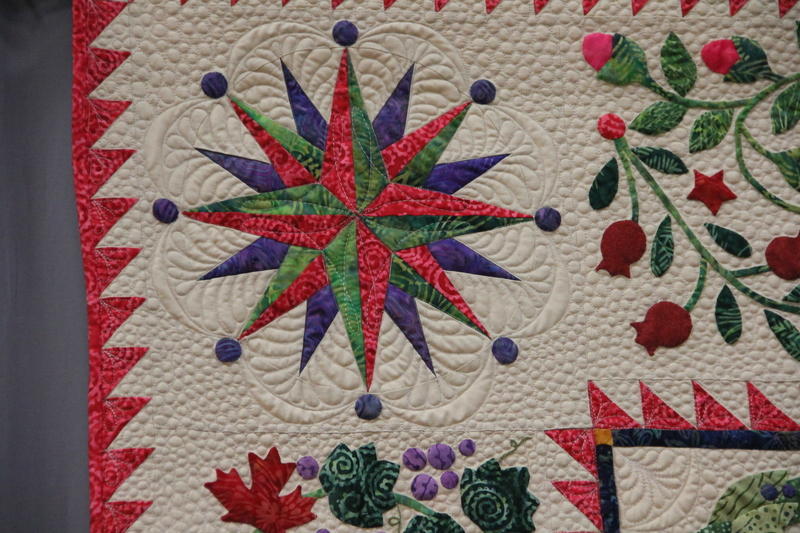 Linda B’s Glacier Star – I love how she added to the main body of the quilt with her “tucked” border and this beautiful Jason Yenter print. 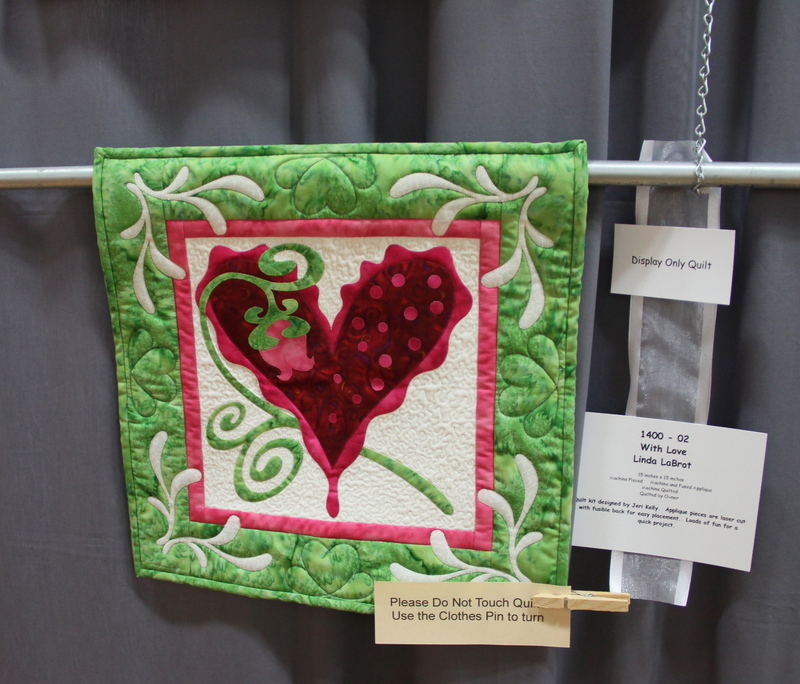 Kim’s quilting (A Busy Bobbin) was honored with the ribbon for Best Machine Quilting – WELL DESERVED! Our local longarm bee is excited to have Kim as our speaker Monday night at our monthly meeting. 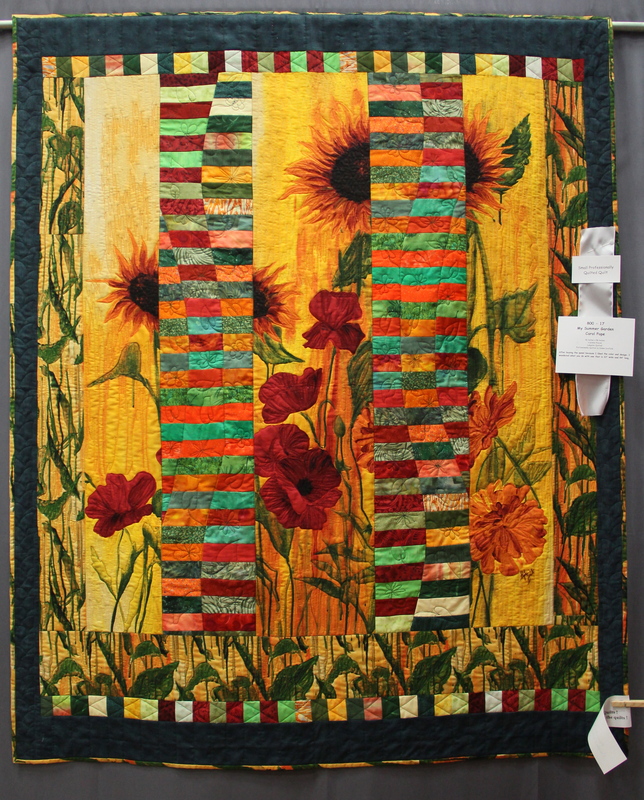 She and Linda B. will be joining us and talking about the rulers Kim uses and how she fills all that empty space with all of that gorgeous quilting. 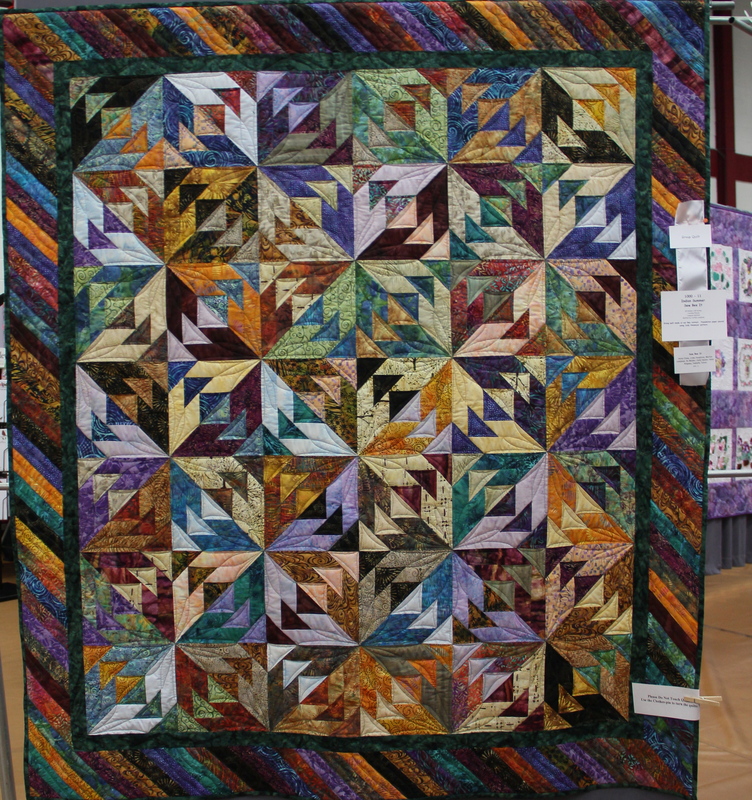 Kim from “A Busy Bobbin” did the quilting! 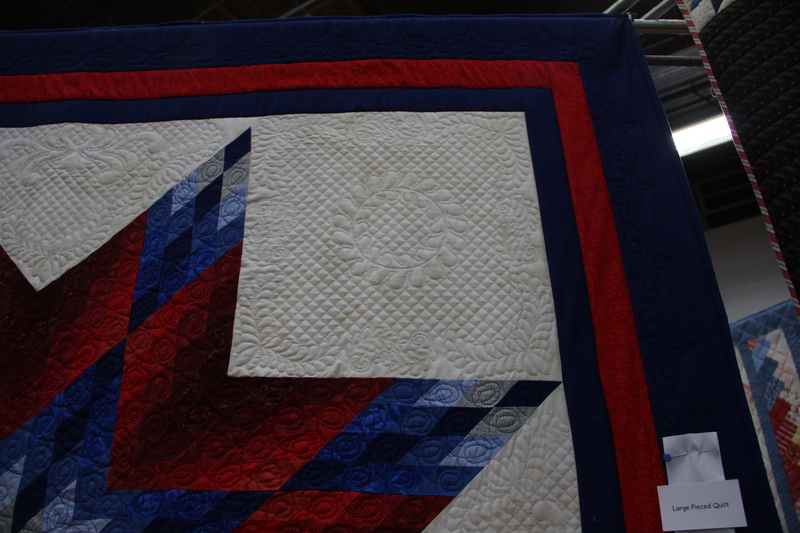 I took several pictures of quilts that I enjoyed the setting of the blocks. 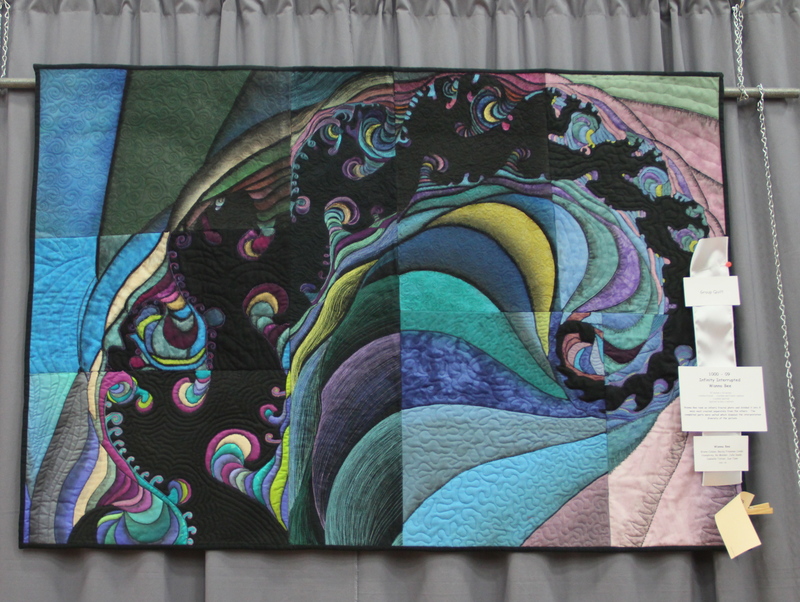 I love Stephanie Brandeburgs panels – I like how this quiltmaker broke up the panel. 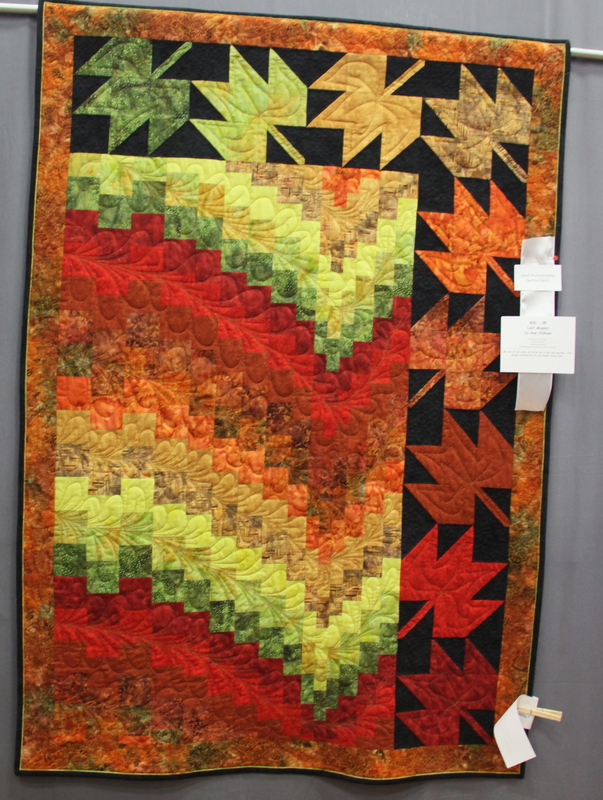 Great bargello quilt – love the addition of the leaves in the border. 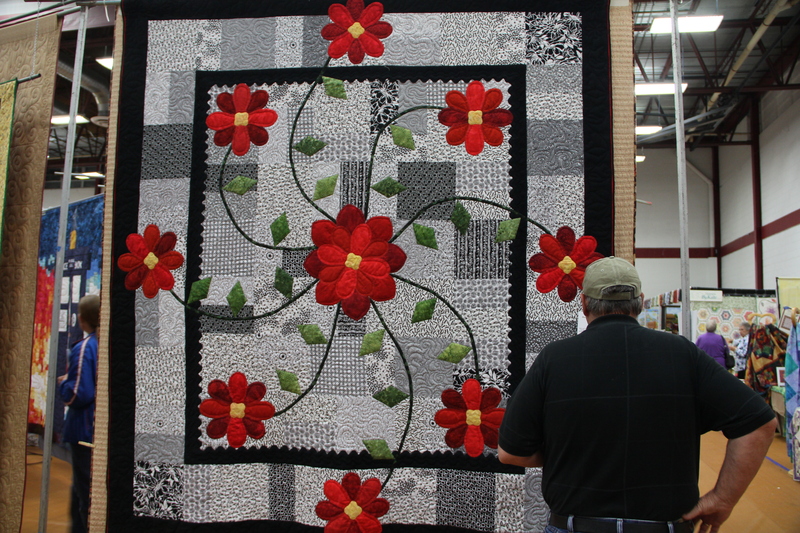 And the quilting ideas I find at shows! And these were just fun quilts, the colors are probably what draws me in. Love the color in this one too! Great block! Isn’t this little mini pretty? 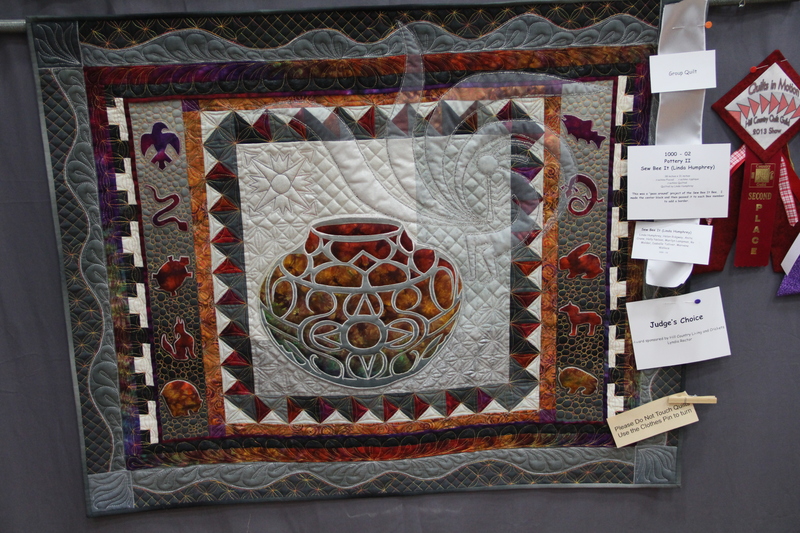 This quilt was a group quilt. They started with a photo, cut it apart. 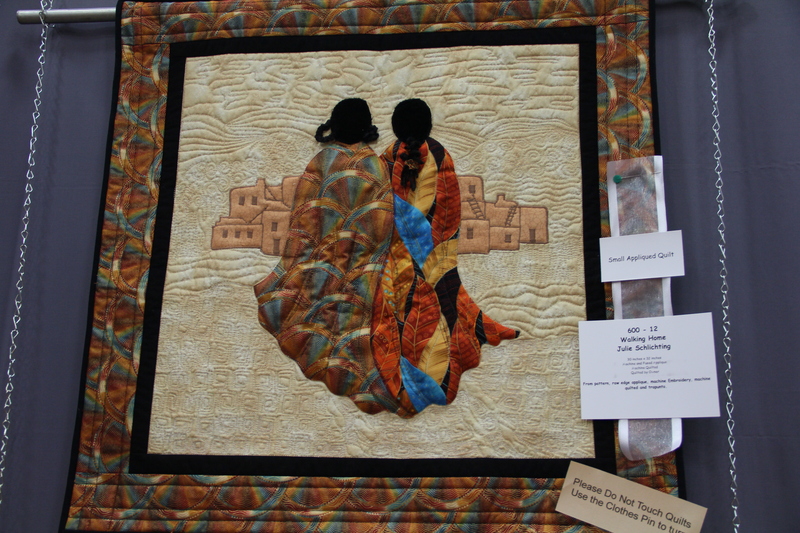 Each member of the group was given a section of the photo to reproduce in cloth – and now you see the quilt put back together. I think this would be really fun to do – what do you think? See the seams? This shows where each members work was added! I am not usually a fan of T-shirt quilts – but this one I love! 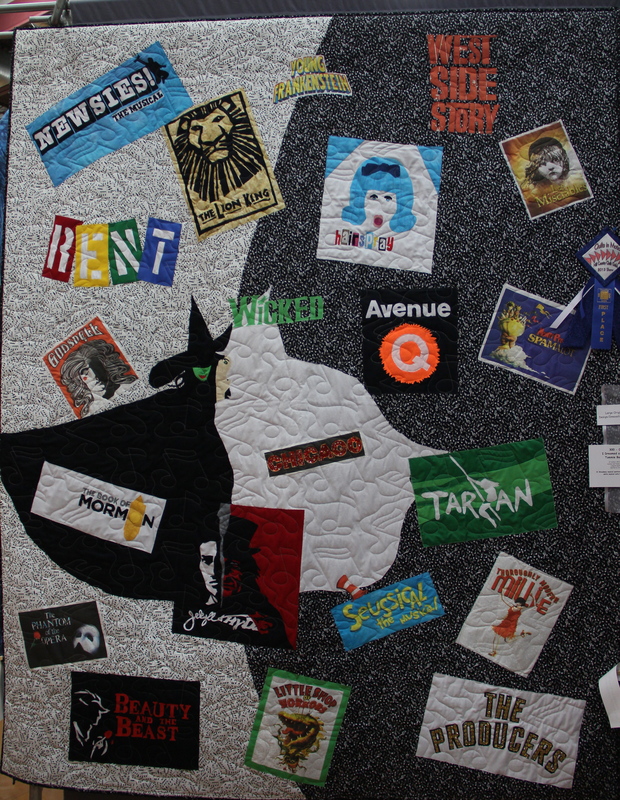 This was a wonderful t-shirt quilt! 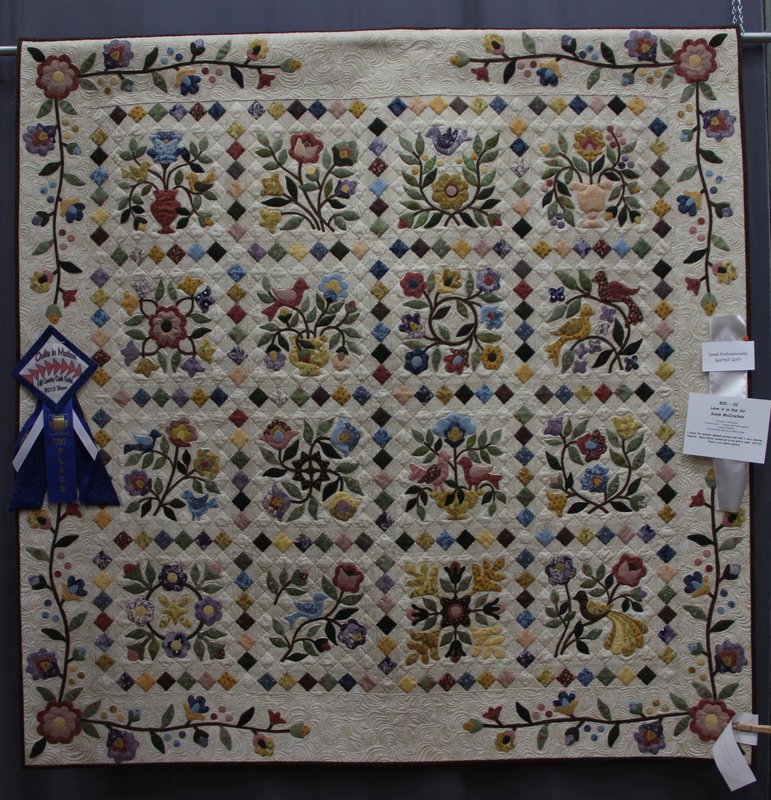 And of course I left the BEST for the last – Best of Show went to this beautiful quilt – this pattern is Ladies of the Sea by Sue Garman. 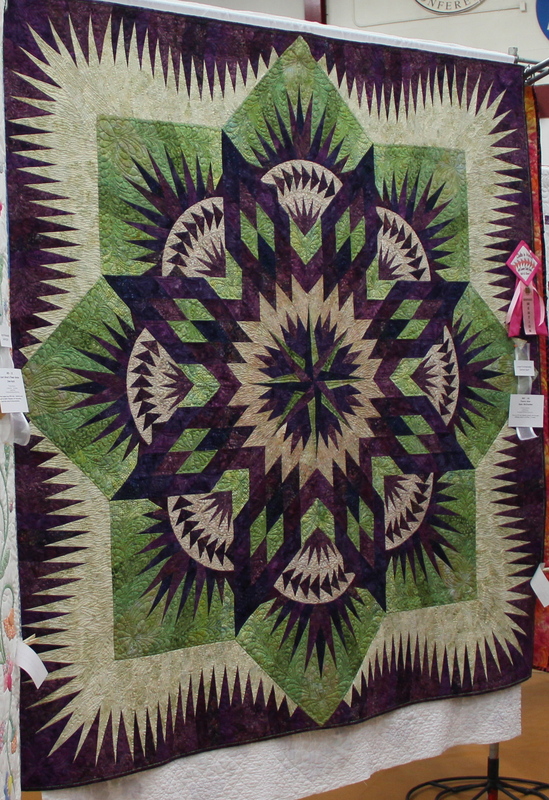 Sue is a friend of mine and she was working on this quilt when we travelled to Brigham City, UT a few years back. If I remember correctly the compass corner stones were inspired by some wall art in the facility where she was teaching (I went as her helper because I am originally from UT). It is a marvel to watch Sue work she is AMAZING! I hope Sue will enjoy the substitution this quilt maker made to the original quilt. 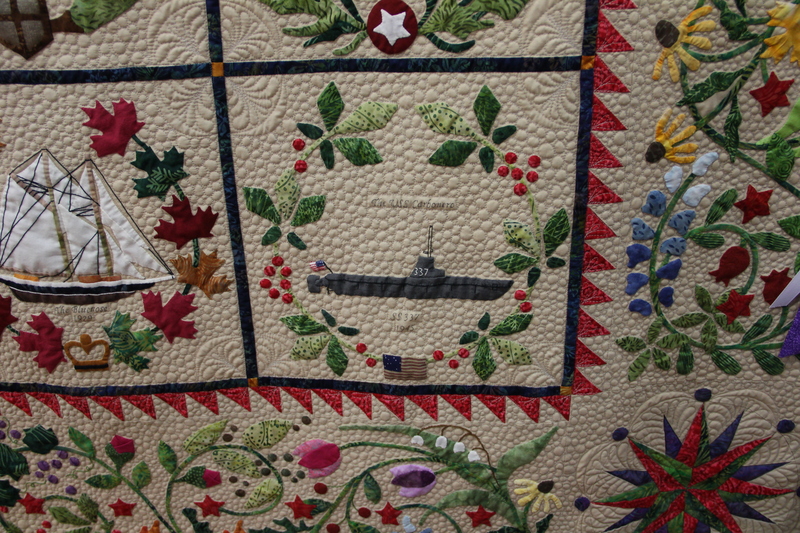 The submarine honors a family member if I remember correctly. 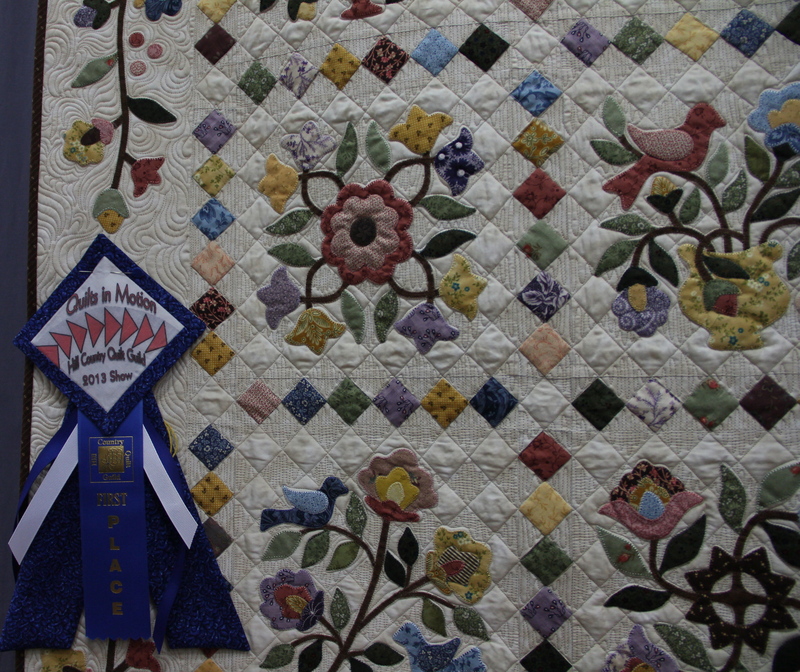 Best of Show Quilt – pattern is Ladies of the Sea by Sue Garman. 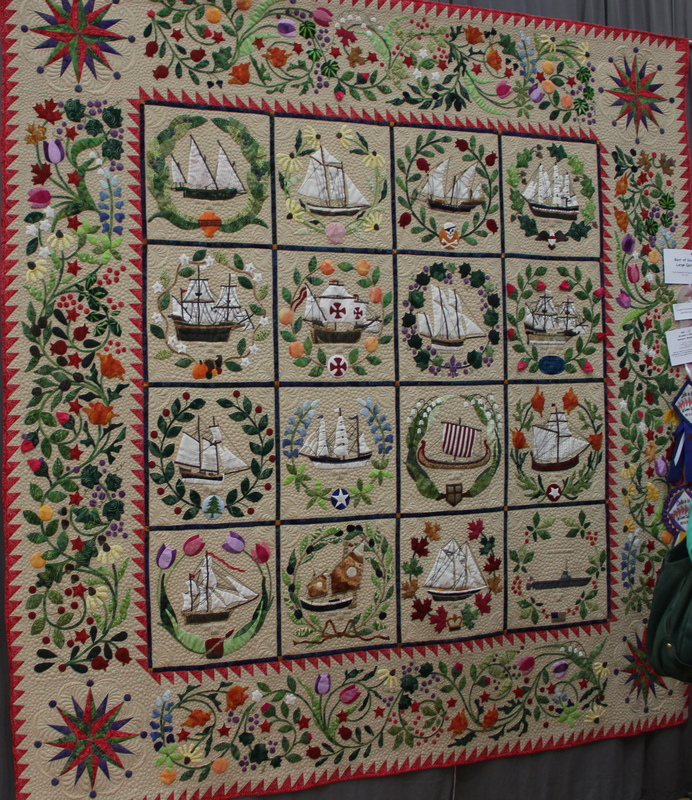 A substitution to the original quilt (which is all tall ships). 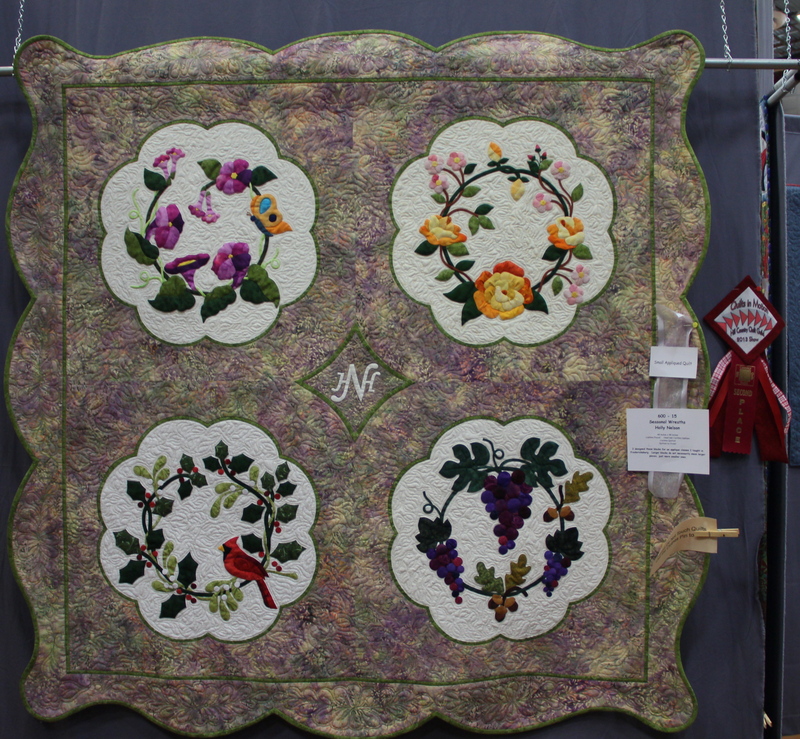 I hope you enjoy my tour of the Kerrville Quilt Show and if you are in the area for Memorial Day weekend in 2015 you should add this show to your list of activities. Had hoped to get to Kerrville this time for their show. Now I am going to work on making it 2015.